Mohawk Plantswoman Katsi Cook on traditional women's uses of berries for nutrition and medicines. Menu links to specific plants info. SACRED CEDAR (juniper): multi-tribal uses, detailed substance composition, vitamins/health, smudging, abuse of a sacred tree in northern Minnesota. Ethnobotany Cafe Besides some links, main attraction is a chat section, where people ask questions, provide info. Ethnobotany archives, herb exchange, and some links. Basketmaker Dyes Plants info Very brief info on plants used in basketmaking by Northwest Coast tribal people, by ONABEN, Native access provider for northwest coast area. Nez Perce Plant Foods sidebar from unofficial Nez perce homepage, brief discussion of a root that's IDed only by Native name, and the camass lily bulb that is a traditional sacred food of such great importance to tribes of the Idaho area that US wars to take this land are called "Camass wars" though that's not mentioned on this brief page. Blueberries -- Economics of commercial blueberries for Native people. Read above this sub-section and below it. Return to series menu page and find out about Big Casino. BOOKMARK each of these databases. You cannot readily switch from one to another. American Indian Ethnobotany Database--At the University of Michigan. Almost 4,000 plantnames, uses for food, medicine (the emphasis), fiber, and utility. Botannical names work best, but common can be used (no Indian names) as searchterms. Result will be a list of articles, reports, and books by ethnographers and occasionally tribal organisations, most not readily available. But for serious researchers, a start. You must take notes. A bug in the software will save pages of hundreds of retrieved cites only as an "empty" searchform. This is certainly a nuisance. This database ius a citator, but its contents include secondary sources such as PhD theses, so you cannot always find pointers to primary sources mentioning the plants, and secondary sources do not give the date at which the info was collected, nor by whom. The 4 AGIS databases are the project of the U.S. Department of Agriculture's research section, programming created by the Genome Informatics Group. Dr. Jim Duke, the only aggie who has much interest in Native plant uses (ethnobotany) who actually works with Native elders is one of the sparks of this project; his job was ended by Congressional budget cuts. It's not clear how this will affect the big ethnobotany database, which was a work-in-progress that does not appear to have a high U.S. goverment priority. It is very usable now, with 3700 plants, but much more could and should be added, both in data content and programming for effective use. For now, it is the most powerful tool available to Native Plant Uses researchers. These aggie databases appear to have been inspired by the U. Mich one, and then to have gone beyond to try to prepare native plant data in ways parallel to the way the research labs do for agricultural plants. AGIS Medical Plants Native American DataBase (MPNADB)--Similar to the U. Michigan database, but with the money and resources of government agencies behind it, the database is a more powerful searcher on the 3700 plants it contains. Data sources are the same oldish reports. But the additional AGIS ethnobotany databases make the combined, cross-refencing databases very powerful. AGIS: Database: FoodplantDB: All classes top--This database works the same as the medical one, but now draws on literature references made to tribal uses of food plants. You can go at it by tribe, by plant, by author, by some term for food-in-general (fuzzy searching; wildcards). You can't go at it by nutrient. AGIS: Database: PhytochemDB--Here's where we can (someday maybe) find out the nutritional (and other biochemical) components of any plant in the databases. Start by zeroing in on the plant (should know its official botannical name for better results than &qut;common name" searching). The first output will be a clickable list of biochemical components, Click on any one of those chemical names and it will tell you bodily effects (if known).Below that will be a listing of all species containing some amount of the chemical you just clicked on--sorted only by plantname, not by order of amounts of the chemical, unfortunately. Nicely formatted tables telling where (leaves, flowers, fruit, seeds, entire-plant), as well as what and how much in that plant. There are several other Table options. This database is both exciting and frustrating. The frustration stems from not being able to evaluate the quality of its data -- when were the analyses made? by whom? under what conditions were the plant(s) grown? AGIS: Database: EthnobotDB--This database lets you ask "for any included tribe, what all plants did they use for anything?" and get a clickable list (often very long) back. Or you can go in by disease or ailment and ask "What all plants do all tribes use as cancer remedies?" It is not limited to North American Indians -- you can see if a variant species was used in Africa, Asia, or Europe, too. AGIS: EcoSys--EcoSystems is the most recent ethnobotanical AGIS database to have been created (Oct. '95), containing just over 800 plants. At present it doesn't have their habitats, interactions of cycles with those of other inhabitants, etc., just a list of temperature, water, and soil conditions each needs -- possibly useful to figure out ranges or plan for trying to grow them. Obviously they would like to expand this database, if government support and personnel cuts were to permit. Overview: After working extensively with these databases I conclude that no knowledgeable native people have been substantially involved in either the government or the University projects. The AGIS project has the greatest practical value, but its structure and contents right now reflect a design oriented to the needs of medical drug companies, the agriculture industry, and their researchers. There are indications by fund and personnel cutbacks that the "native plants" project has low priority with U.S. budgetmakers, hence with USDA. Native awareness of this project and its potential uses is a first step to getting both better support and more functionality from the viewpoint of our own potential uses for this kind of info tool. Many plant images, maintained by Southwest School of Botannical Medecine (Michael Moore). Major plant photos, engravings, drawings imagebase gateway. More than a thousand quality plant pix accessible by botanic, common name and (some) by Spanish-name indexes. University of.Wisconsin (Madison) botany gopher--Here's where the majority of my plant pix come from. There's a couple years of botany classwork ID pix, field trip, and most of all, extensive visual class lectures, organized by habitats, by Dr. Virginia Kline (of the Madison Arboretum). Fantastic botannical pix resource for the Great Lakes region. Dr. Kline visited and photographed prairies, too. You could practically get yourself a degree in botany just browsing these pix. They are IDed mostly by species name, but sometimes by common names, so you need a book source to look up plant names. To get the plant you're interested in, prepare to spend a lot of time exploring. Dr. Kline's teaching collection of images Many subdirectories which are named by environmentla areas where the wild plants imaged grow -- from different types of forests to prairies to wetlands to beach areas. Fungi image collection and info Gateway to collections by Tom Volk (La Crosse botanist). contains lifecycle of morels, the most delicious mushroom in the world. Texas A&M U Botany Herbarium Image Listing--In a way this is a better organized plant image gallery, but the organization is for professionals. You need to know the family, not just the genus-species botannical name of the plant whose pic you're seeking here. You can browse this listing and perhaps spot its botannical name out of the hundreds grouped by the big families. Elsewhere on this TAMU herbarium site are access to threatened plants info, a huge technical plant info database (all text), and some Texas plant info that includes regional maps of their ranges. Hopkins Technology, Multimedia Publishers:Herbalist CDROM, PC, Mac --Over 100 plants, pix, multimedia. By British herbal physician and Dr. Jim Duke of USDA. Check table of contents, sample definitions, reviews, even order it ($49.95). But you can get it $15 cheaper from Edutainment's on-line CDROM general catalog. Jump right into their nifty Herbalist page. Books on-line from US Government via Hopkins Technology--Well, pamphlets, really on health and nutrition written at a level most kids will comprehend. Botany Related URLs: All Links--a 196K page, takes some time to load, but then there's a menu for visiting links. For serious plant research, using all available InterNet botany sites. Download this page, load it locally (with OPEN FILE) and do your InterNet plant sites searching that way. Herb Research Foundation--Analysis and documentation of nutritional values, many native plant projects, legal info on marketing herbs. Sister organization of American Botannical Council. Australian National Botannical Gardens - Aboriginal Trail--much info here on indigenous people's use of plants for 40,000 years. Ethnobotany--How the Mayans Used Corn--Background text and simple activities for a recent "Newton's Apple" science program series, KTCA-St. Paul, MN. Videotape available from the station. Lessons can be used independently--collecting, classifying local plants to illustrate what ethnobotanists do. Also relates to MayaQuest curriculum materials. Grades 5+. The Roots of North American Medicine: Jean Wyatt, Indian Life Mag, Iv #3, 1994, easy reading, suitable for elementary school-level children. Nez Perce Traditional Foods--from the tribal web pages. Chez Marco's Botany Pages--Wonderful multimedia site for Middle School + botany study, by Marco Bleeker, Dutch naturalist and photographer. Multimedia presentations on rain forest, the ecology of a Dutch dump, more. Nifty site presentation/organization. RECOMMENDED BOOKS -- for novice Native plant researchers and for students. 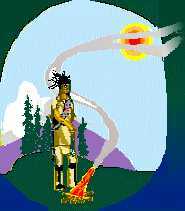 CREDITS: The Woodland man sprinkling some herb into his fire was drawn (in black and white) by John Fadden, well-known Mohawk artist and art teacher for the 1974 Akwesasne Notes calendar. I digitized and colored it for these pages. Most of the photos on plant pages linked to this one come from two of the big on-line gopher sources of plant ID pix: Herb Research Foundation's gopher images gateway and University of Wisconsin Botany gopher. A few images came from the TAMU experimental digitized herbarium. Webmistress --Paula Giese.Text and graphics copyright 1995.